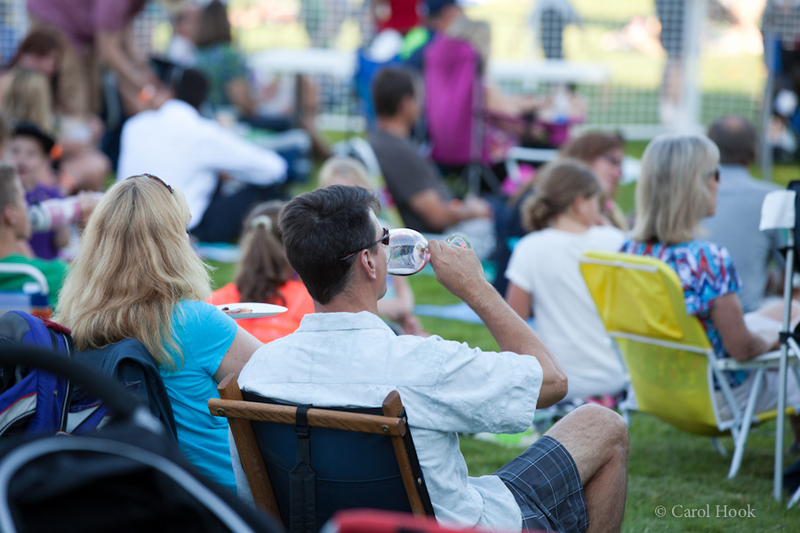 Celebrate Woodinville 2015 Summer Concerts in the Park! 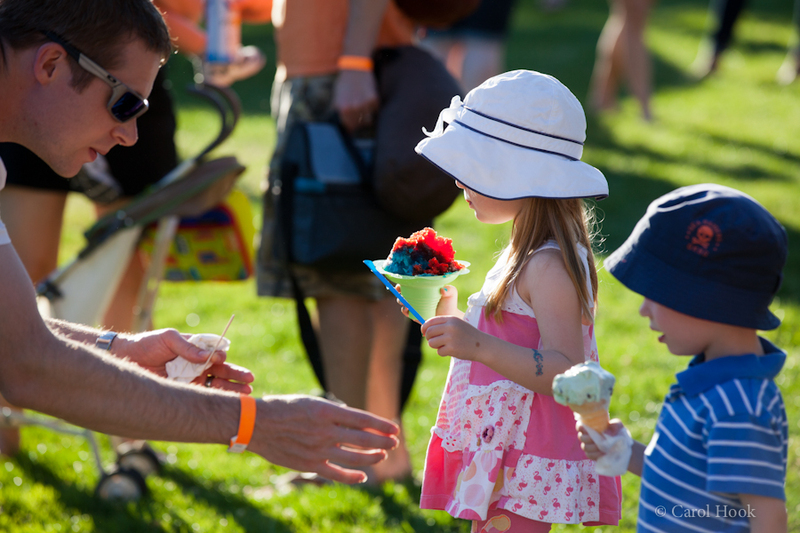 We are looking to make Celebrate Woodinville an even more family-friendly event for 2015! Gold Sponsor Windermere Real Estate Woodinville will be hosting a ‘Family Corner’ at each Wednesday evening concert in the park. We’ve also brought on board, The Nest as a Silver Sponsor for 2015. Both Sponsors will have fun crafts, games and activities to keep the kiddos entertained. 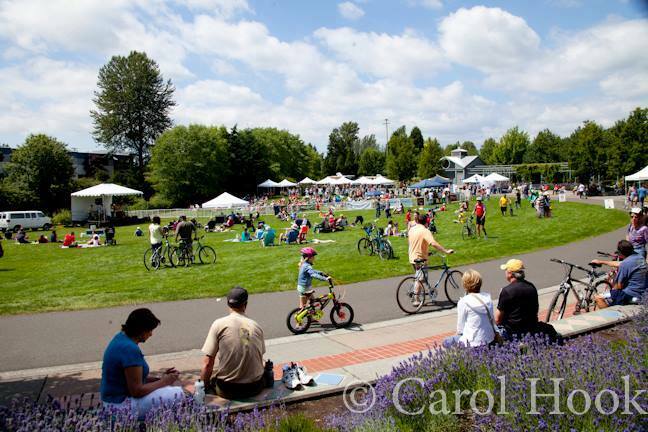 For the August 15th Festival, the Northshore YMCA will again host Family Friendly activities on Woodinville Fields – keep an eye on the website for updates. Our Collection is at 11 Rosé Wines for Our Party! 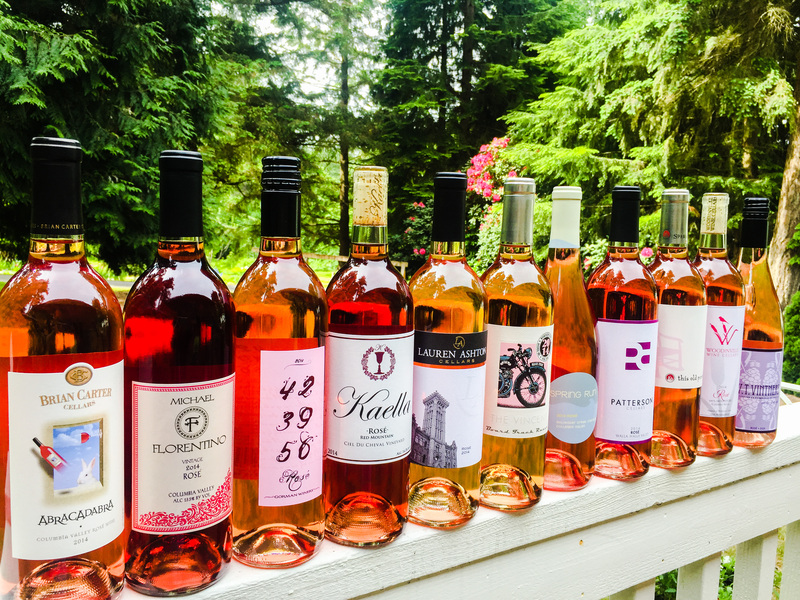 I’m very excited for our 3rd Annual Woodinville Rosé Roundup Party at our home this summer! Here are the 11 wines so far….I think Kevin wants to keep adding to it! For one, JM Cellars has an amazing Cinsaut Rosé that we tried the other night at the 1st Annual Experience Woodinville Event. Avennia also has a great Rosé, that we tried on Sunday, a blend of 65% Grenache, 35% Mourvedre. I am sure there are more we are missing! 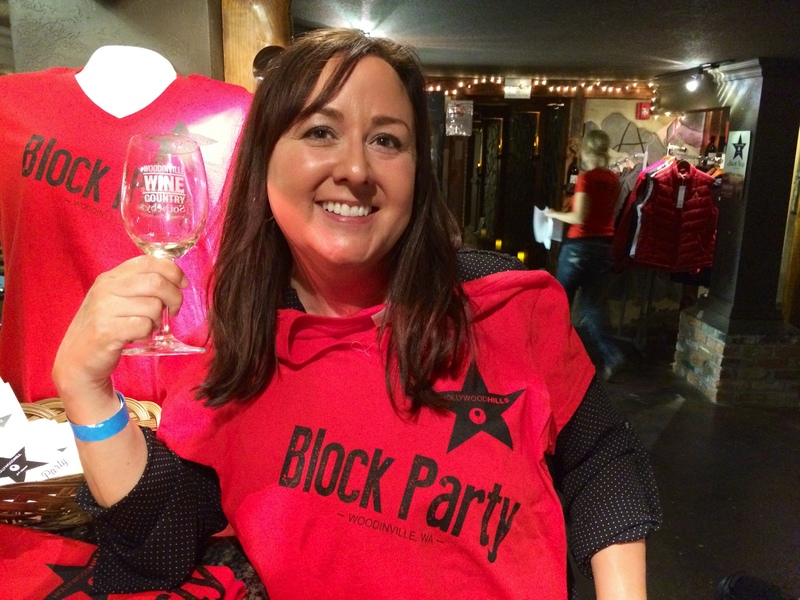 Brian Carter Cellars, Michael Florentino Cellars, Gorman Winery, Kaella Winery, Lauren Ashton Cellars, Mark Ryan Winery, Novelty Hill – Januik Winery, Patterson Cellars, Sparkman Cellars,Woodinville Wine Cellars, WT Vintners! 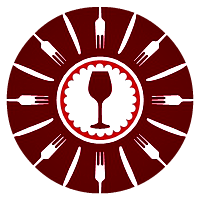 © Copyright Notice: TastingFoodWine 2012-2015. Unauthorized use and/or duplication of this material without express and written permission from this site’s author and/or owner is strictly prohibited. Excerpts and links may be used, provided that full and clear credit is given to Julia & Kevin Brendt DBA TastingFoodWine and http://www.tastingfoodwine.com with appropriate and specific direction to the original content. Procuring wines for our 3rd Annual Rosé Party….the tradition continues. 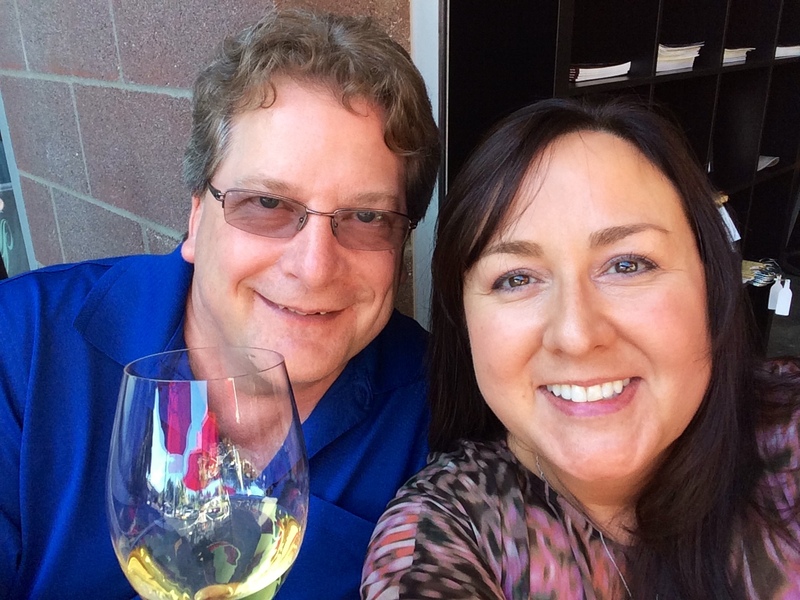 It is Spring time in PNW after all, and we do get rain, but no amount of rain dampens our spirits to head out and discover & explore new wines in Woodinville! Last weekend recap: Kevin and I had a great time! We picked up several cases of Woodinville Rosé wines for our 3rd annual Rosé party in August. 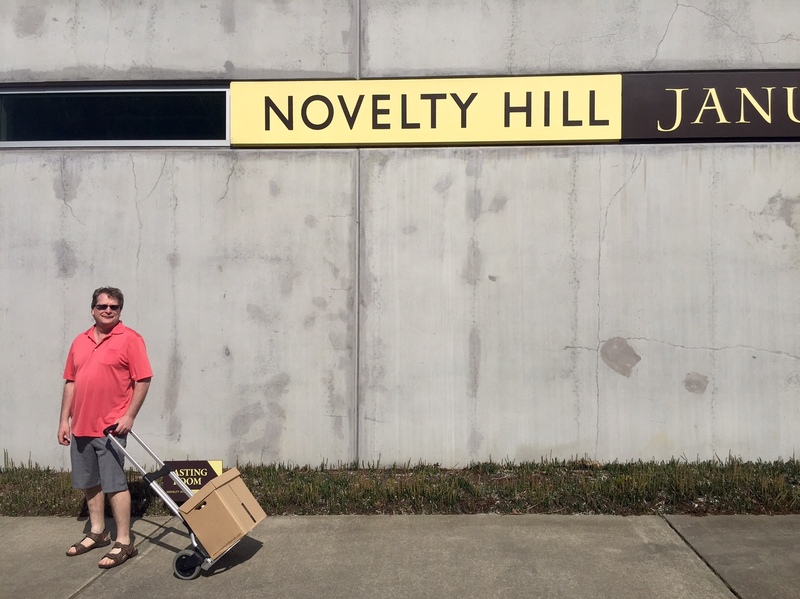 Novelty Hill Januik, Lauren Ashton, Gorman, Woodinville Wine Cellars and Mark Ryan all procured last weekend! Below is our line up…. so far! I see some new releases coming up, and I’m waiting for John at JM Cellars to release his to add to our lineup! 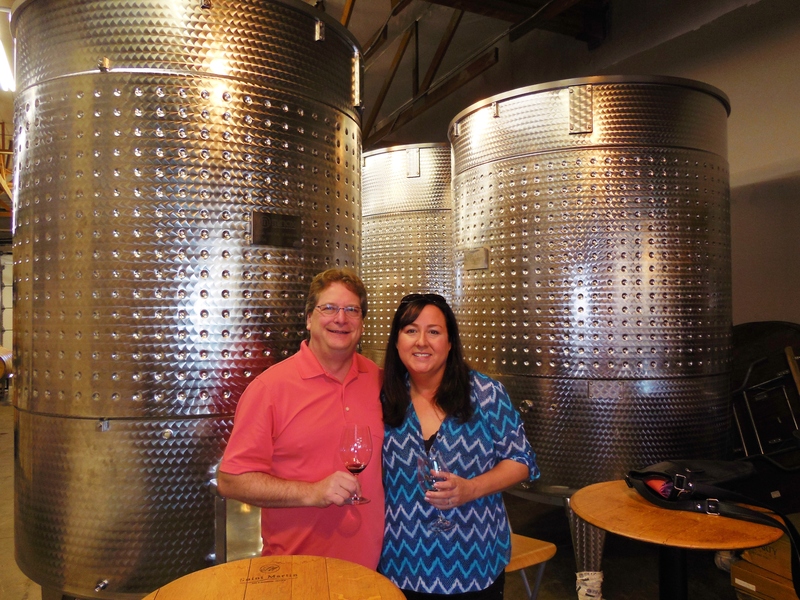 We also stopped in at Force Majeure Cellars for their release party, unbelievable reds, their wine maker is Todd Alexander, who relocated to Woodinville from the Napa Valley to join this exciting time in the industry here. 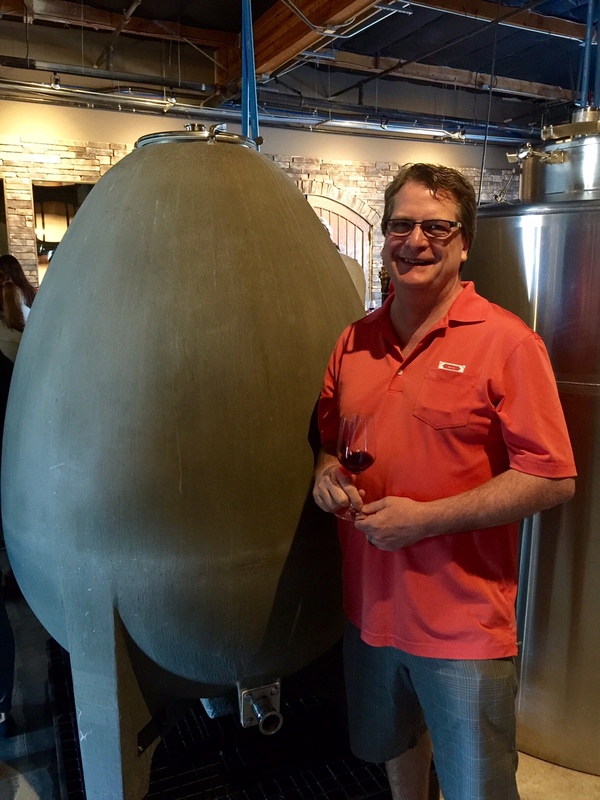 Here is an article from Jan 2015: http://www.greatn rthwestwine.com/2015/01/30/force-majeure-wine/ We chatted with winemaker Todd about the clay egg and tanks that he uses for some of his wines at Force Majeure, and his experience in Napa. It’s serious when we are shopping for wines for our party! Kevin takes a cart! A stop at Novelty Hill / Januik for their Spring Run Rosé 2014. Crossed the round abouts at Hollywood Schoolhouse district to pick up Gorman and Lauren Ashton Rosé. 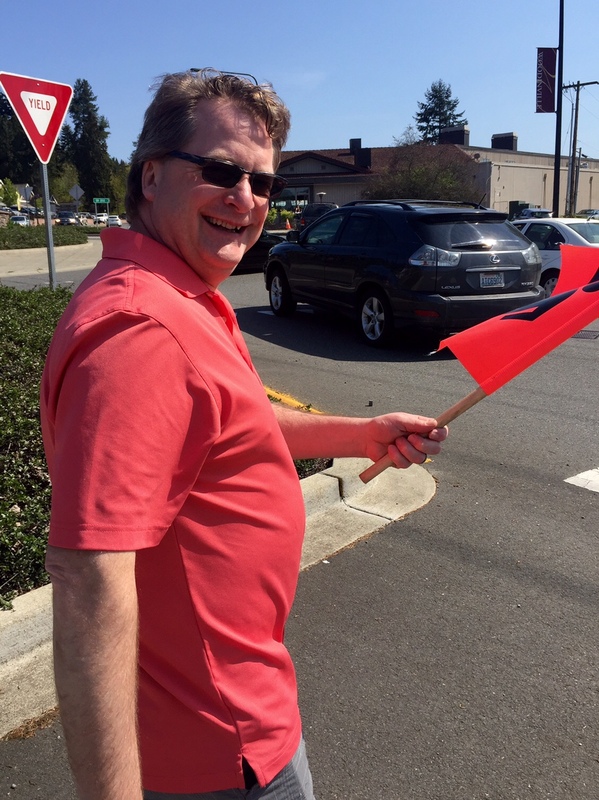 Only seasoned Woodinville wine tasters know you have to take that flag across the intersection there, people are flying around those round abouts. 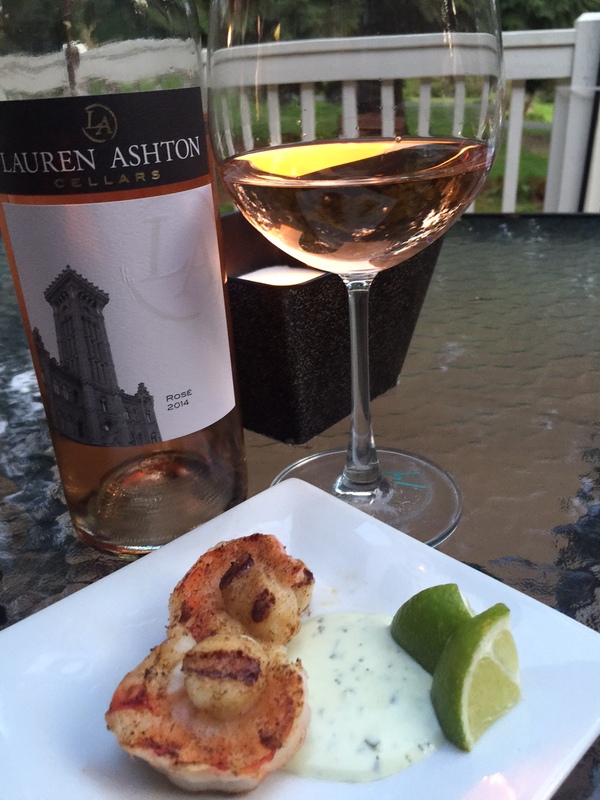 When we got home, Kevin thought it would be fun to taste LA Cellars Rosé 2013/2014 side by side with our Sea Bass dinner. We liked the 2014, it had more melon flavor than the 2013 and the color is fantastic! The Sea Bass dinner Kevin cooked up at home, we ate it out on the patio with our heat lamp flaming away, pretending its Summer is always fun. He also whipped up a prawn wrapped cajun scallop appetizer! Start the weekend off right @ Patterson Cellars/Gorman: Music on the patio James Coates from 6-8 pm, glass pours, and one of the best spots to be on Friday night at the roundabouts. 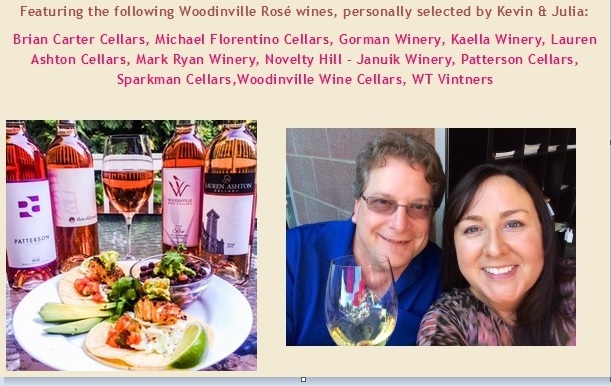 Woodinville Wine Cellars: 2014 Rosé and 2012 Cabernet Franc Release: Release party for their 2014 Rosé and our 2012 Cabernet Franc! This is going to be an awesome PARTY with BBQ, outdoor activities (weather permitting) entertainment, and a great time of socializing and having fun! 17721 132nd Avenue NE. 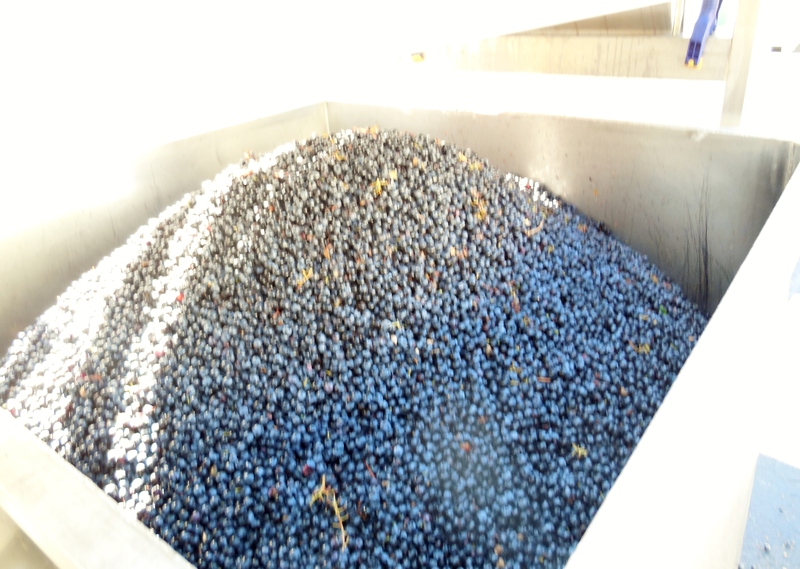 http://www.woodinvillewine.com/. Force Majeure Winery: 1pm to 5pm. Release Party for featuring samplings from their estate wines and collaboration series Rhône wine offerings. Also, live jazz from John Seman Quartet and delicious food from Crisp Creperie Food Truck. This is one winery Kevin and I have not yet visited, and I am looking forward to checking out their wines. Warehouse District: 18720 142nd Ave NE. http://www.forcemajeurevineyards.com/ Please email Carrie at carrie@fm-wine.com for more info. Do you have the time to enjoy a 9 course dinner at one of only 42 Restaurants in North America rated 5 Diamond? The Herbfarm, a 5 diamond restaurant, right here in Woodinville, WA! Winter’s firming waters and the converging spring warmth serve up the best seafood of the year. Join us for our annual tribute to the bounty of the Sea in the Pacific Northwest. 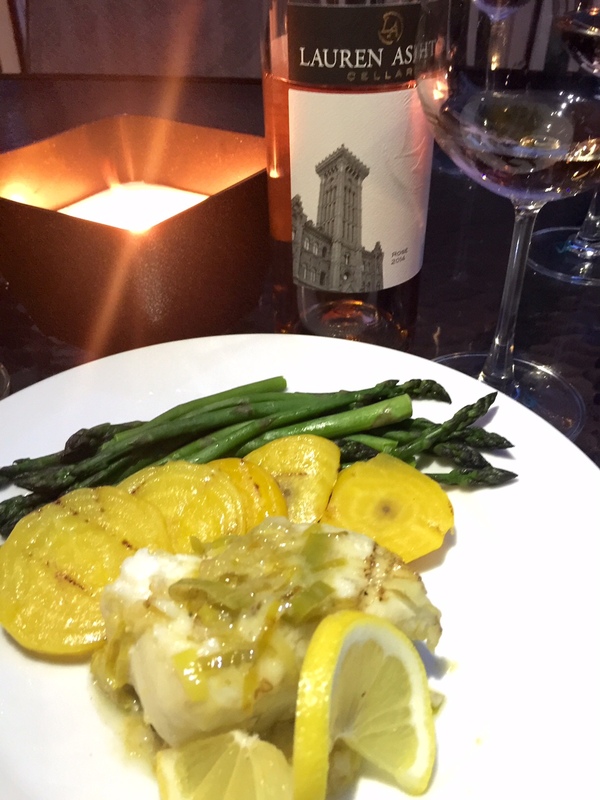 It is Halibut season and WA Wine month. 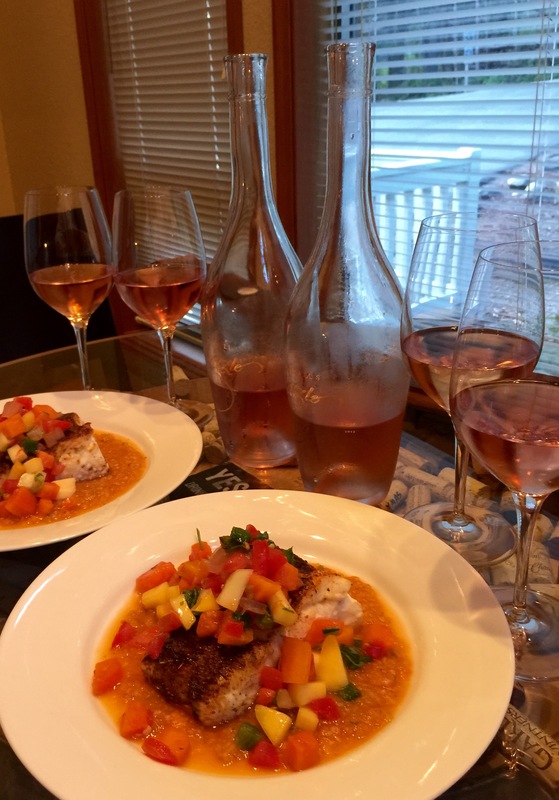 Tonight at home (aka “Café LeBrendt”) Kevin cooked up fresh blackened Halibut resting in a bed of spicy fruit salsa puree and topped with a mango papaya salsa. The fish was so fresh, the spices of the blackened seasoning (from World Spice Market in Seattle) went really great with the fruits and paired well with a beautiful Washington Rosé. Spring is upon us, and there is no better way to start off spring than with a vertical of Long Shadows Julia’s Dazzle Rosé of Pinot Gris, and a great reason to open up two bottles. 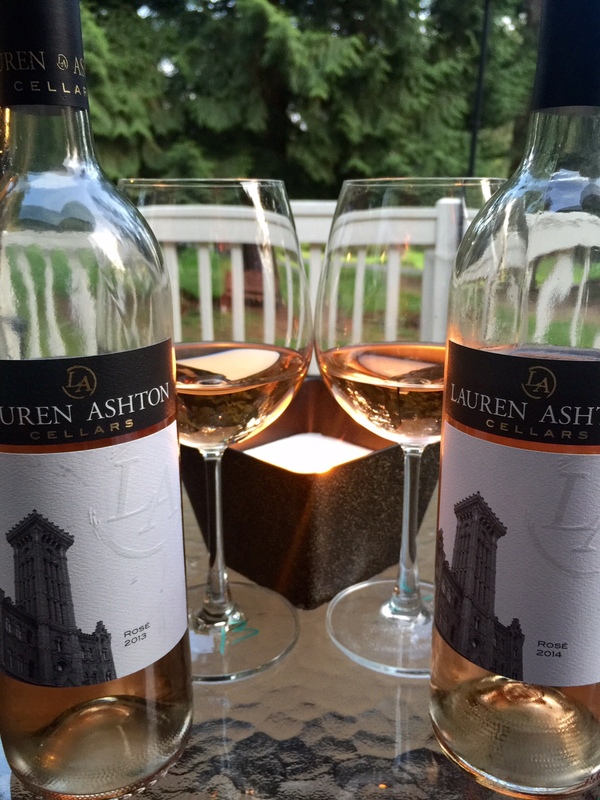 At first glance you notice the color between the two wines, the 2013 has a light copper color compared to the 2014 with a light rose petal hue. Tasting both vintages, the 2013, I get notes of raspberries, strawberries and a hint of sweetness in the finish. The 2014, I get vibrant kiwi and melon notes and it finishes with a slight effervescent. They were both a great accompaniment to the halibut, cooling the palate from the heat of the spiciness of the dish. Spring has sprung, which means more Rosé releases, and Julia and I heading out to cover ground here in Woodinville, visiting many wineries to collect all of the Rosé wines for our 3rd Annual Rosé party here at our home this summer. We are excited about this year’s party, as we will have music by Larry Murante. Along with the wines, of course, I cook up spectacular bites, including a salmon and chicken taco bar. Need suggestions for a great Rosé? Afraid of pink wine? Here are some great ones to try: A Maurice Cellars, Longshadows Vintners, Gramercy Cellars, Charles Smith (Walla Walla wineries). 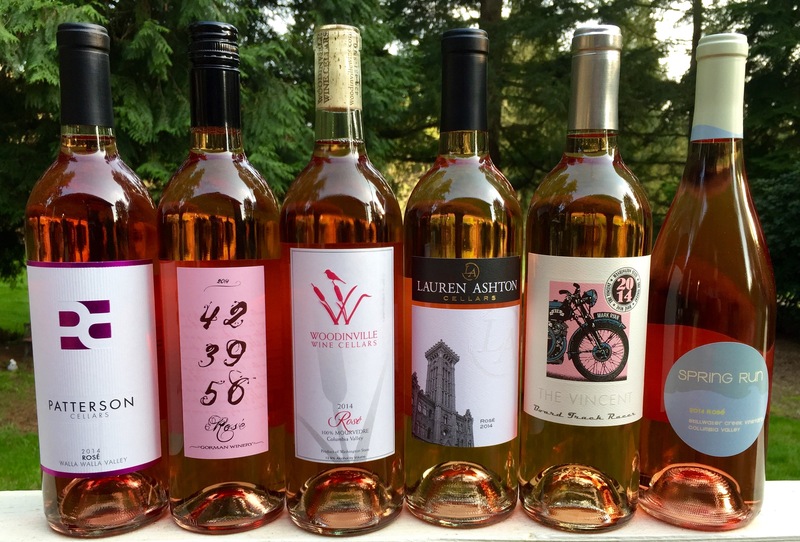 Woodinville: Patterson Cellars, Gorman Winery, Page Cellars, Woodinville Cellars, and Lauren Ashton Cellars Rosé release event is Saturday the 4th of April. I am lucky to have had an early preview of LA Rosé recently and I must say, it’s fantastic once again this year. So, go out and get your Rosé on! This weekend, after dropping off our kids at the YMCA kids’ night, Kevin cooked up a fantastic four course dinner at home with friends. Kevin spent Thursday night preparing his menu for the Saturday night dinner, Sea Bass as the main course, and two appetizer courses and a dessert. 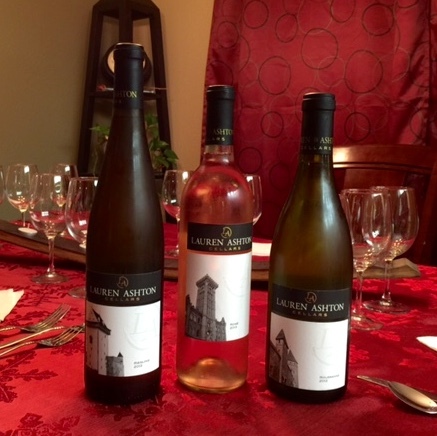 Kevin carefully chose his wines to pair with each course; all of our wines on this night were Lauren Ashton Cellars. Usually winter is for mostly red wine in our house, but on this night, we went for a crisp clean white and rose’ approach. Our first course, a blackened seared sea scallop resting on a bed of lime zest roasted cauliflower puree with a dollop of cilantro aioli, was paired with a 2013 Riesling. 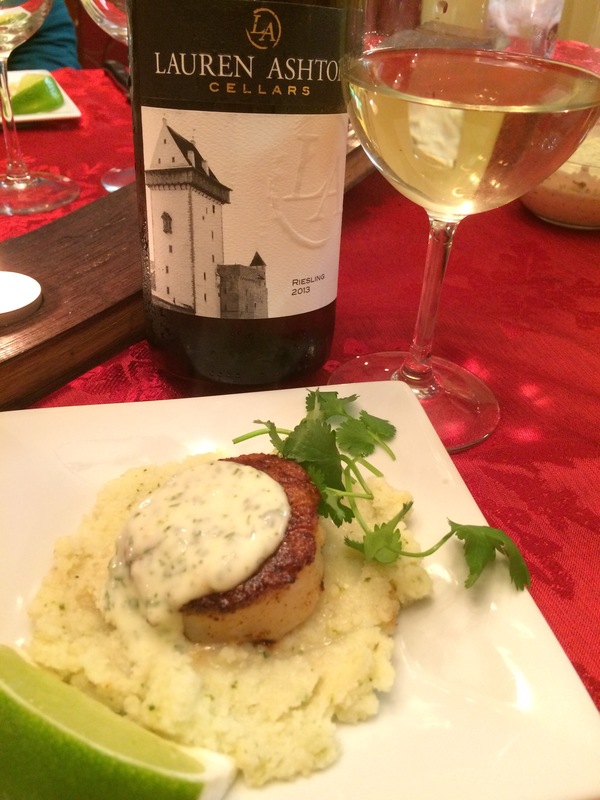 The Riesling is a youthful wine that denotes those pear and peach flavors that offset the spiciness of the blackened spiced scallop and brightens the zest of the cauliflower puree. Our second course, we enjoyed a classic roasted beet and goat cheese salad with balsamic dressing. The beets were tossed with black pepper and truffle oil. 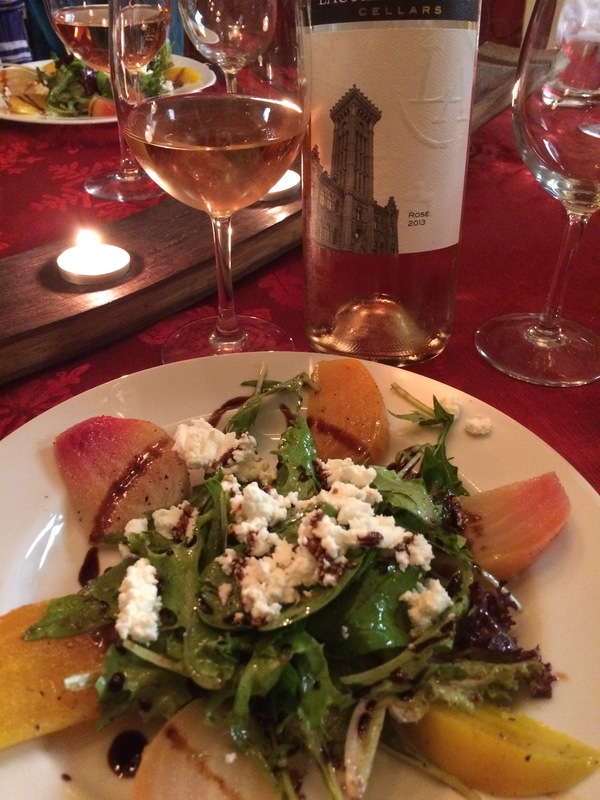 Kevin paired this fresh, light salad with a 2013 Rose’. Kevin’s pairing of the Rose’ with the salad enhanced the hints of strawberry and spicy pepper of this beautiful blend of Grenache and Mourvedre. Sadly, this was our last bottle of LA 2013 Rose’. We are definitely looking forward to the 2014 release. Kevin presented us with the main course of seared Sea Bass resting on a Yukon gold and leek potato cake, dressed with a lemon caper sauce. 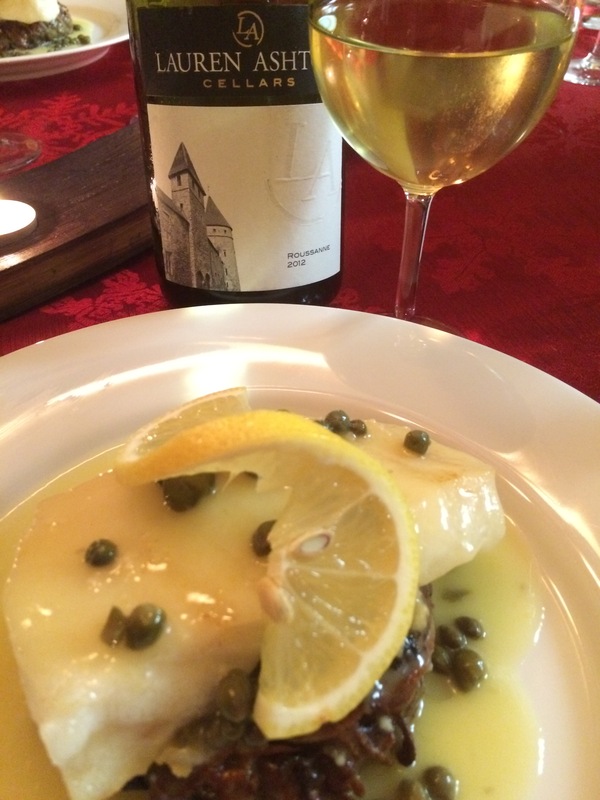 Kevin paired the 2012 Roussanne with the Sea Bass because it is a very elegant wine that has great full viscosity and a hint of mineral that paired really well with the lemon and capers. Topping off the night, Kevin prepared a dessert that was a simple angel food cake sliced thin, drizzled with crème de coco and layered with sliced strawberries with house made amaretto infused vanilla ice-cream capped with a second piece of thinly sliced angel food cake with crème de cocoa with fresh whipped cream and crumbled amaretto cookie over the top. We all enjoyed a night of great food, wine and a lot of laughs and the kids enjoyed their time having fun at the kids’ night out. 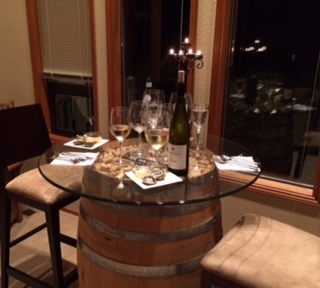 There are many things to do on a visit to Woodinville Wine Country in any season. A perfect day begins with Kevin checking the WoodinvilleWineCountry.com site to see what new release and live music events are happening. Finding a new release event is like finding a treasure that has yet to be discovered, I always find a new favorite wine to bring home. New release events are usually accompanied by small bites, which are paired with the wines. Last weekend, at Woodinville Wine Cellars release party their wines were paired with stuffed mushrooms, beef, cheeses and chocolates. We picked up a bottle of Sauvignon Blanc. 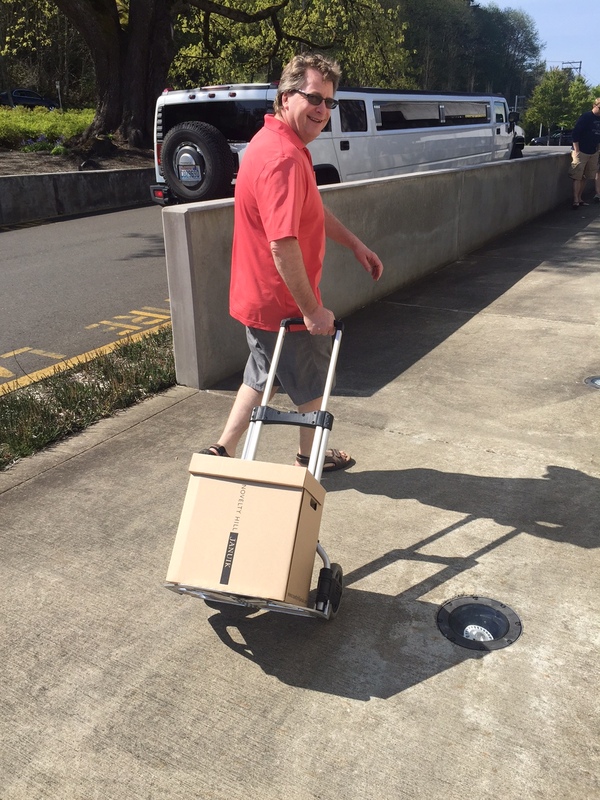 Off to The Warehouse Wineries and Patterson Cellars, where wine maker, John, greets us with a big smile. Tasting through his menu, we always take a moment to wander back to where all the magic happens. 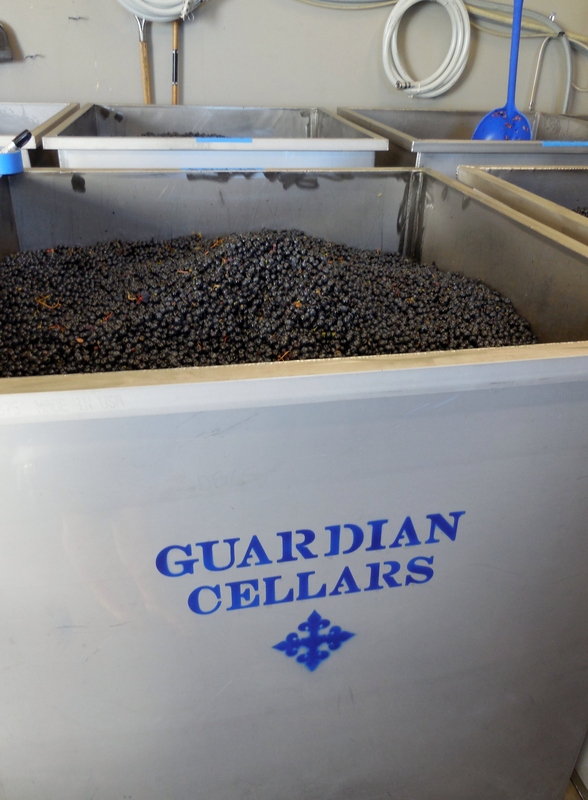 Towering silver tanks holding precious grapes, fermenting away for a future release. 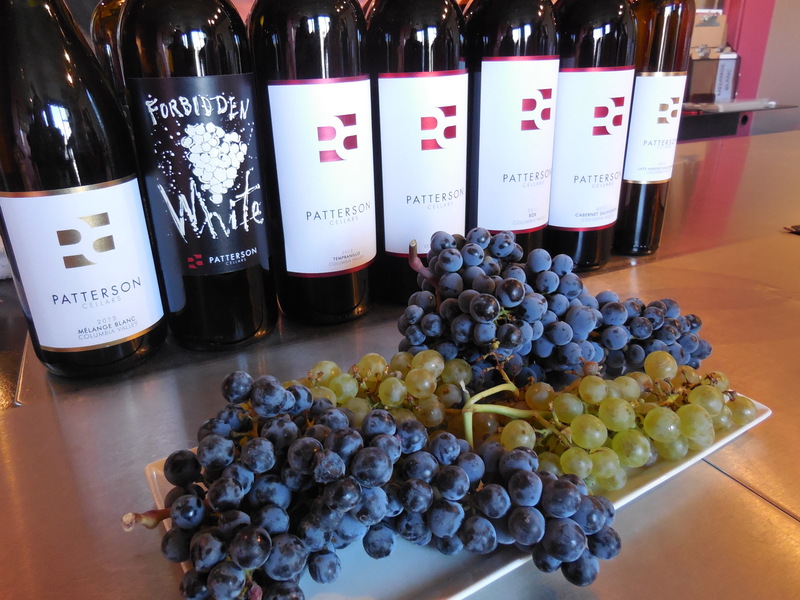 The aroma of the grapes, his wines and welcoming atmosphere are reasons we return to Patterson. 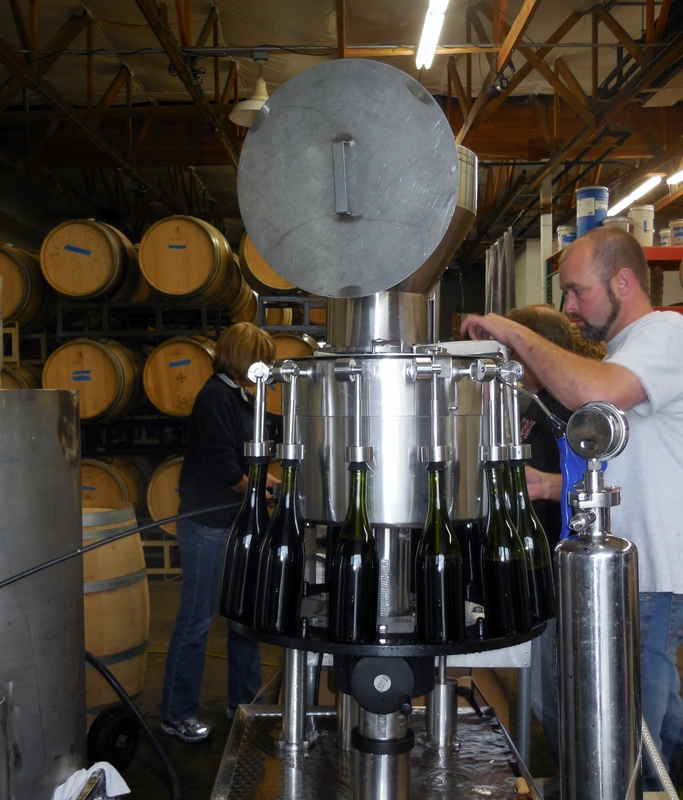 Today, we pick up a bottle of his Bordeaux blend and Melange Blanc, a white blend of Chardonnay/Viognier. Next stop, The Junction, home of a brewery, a winery, and Eastern WA tasting rooms. 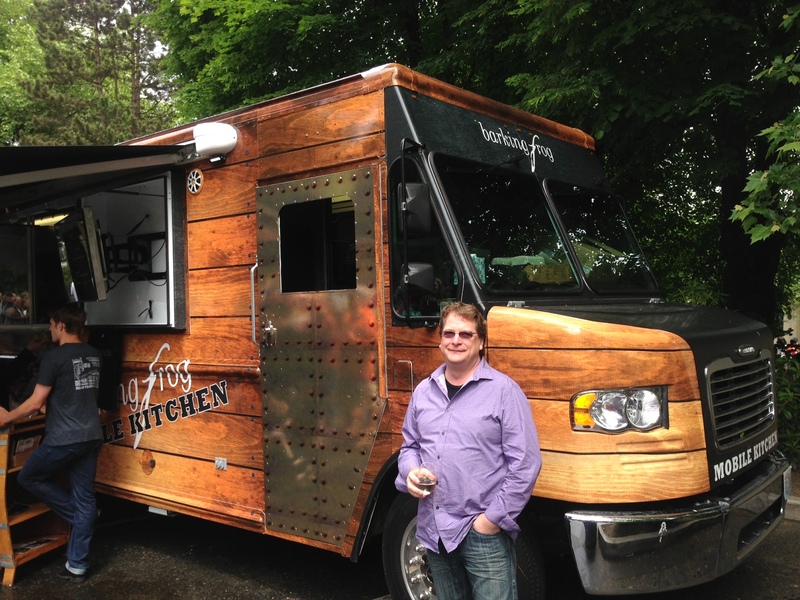 At Armstrong Family Winery, where Jen and Tim are working away producing fabulous wines in Woodinville, we pick up a bottle of Viognier and enjoy a glass with something tasty from the food truck. Then, we drop in at Dirty Bucket Brewery, chat with Steve, share a pint of his porter, and get an update on his expansion plans. Next stop, Tourist District/Hollywood Schoolhouse area, tasting at Lauren Ashton, where Kit makes some fantastic Reds and his Roussanne is one of my favorites. Next door, Bottom of the Barrel (at the pink tractor); Jack and his son make furniture out of wine barrels. 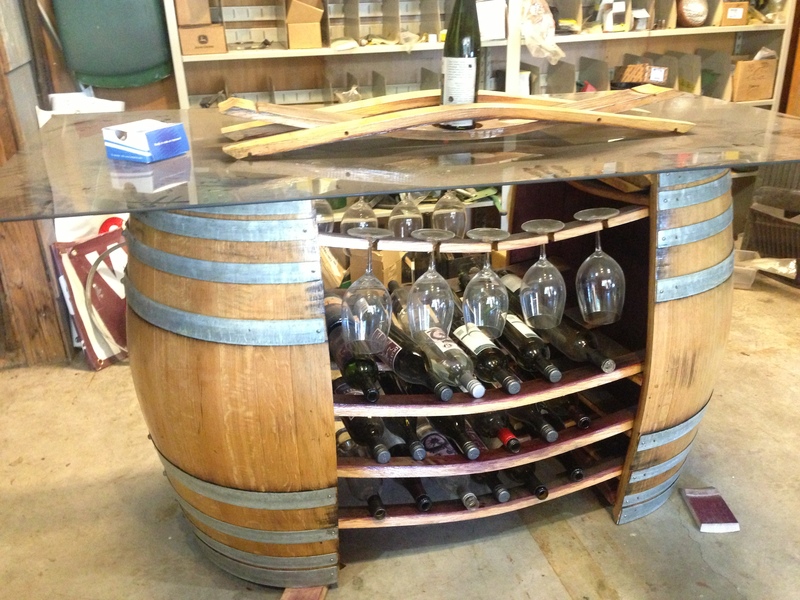 His workshop is open to peruse and we admire the wine bar he created out of two wine barrels. The sun is going down, and we wind down at Gorman/Patterson for a glass of wine and some live music on their covered patio. Hungry, we end our evening at Village Wines, enjoying a flatbread and sweet potato fries. Kevin picks out a Dunham Cellars Red out of the shop, in honor of the late Eric Dunham, and with no corkage fee, because we are wine club members, it turns into an affordable date night. Kevin and I are enjoying the last bits of Summer. Summer is slipping away, what a fantastic Summer we have had here in the NW! Recently, we had an opportunity to spend kid free time at home, where Kevin always cooks up amazing dishes. Kevin made sure it was a special table for two in our own living room by the window, nice touch! Earlier in the day, we shopped together at Central Market and picked up some fresh seafood. 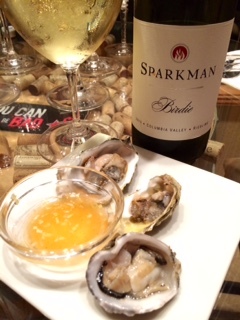 We tried three different kinds of Oysters on the half shell with a garlic, rice vinegar Mignonette with a Sparkman Cellars Birdie Riesling. 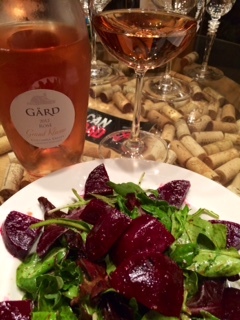 Next course, a Arugula Beet Salad served with Gard Rose‘. 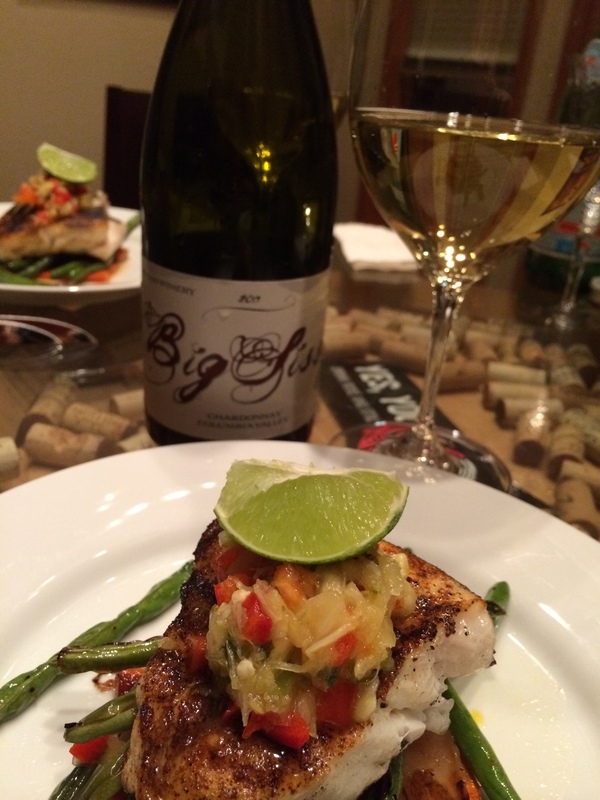 Main Course, Blackened Sea Bass with Gorman Winery Big Sissy Chardonnay. Sea Bass is one of the most buttery fish I’ve ever had, I loved the texture. There’s something about watching Kevin enjoying cooking up such fantastic dishes, and he knows I appreciate and enjoy every one of them. As usual, Kevin rarely uses any butter in his cooking, everything prepared was healthy. 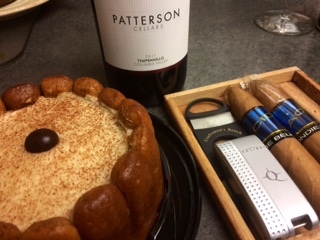 …..with the exception of the Tiramisu dessert we picked up at the store and the Acid Blondie Cigar we shared on the deck after dinner with a Patterson Tempranillo. Hey, out with a bang! Summer 2014! Friday night, the 19th, we enjoyed ourselves at the Hollywood Hill Block Party. 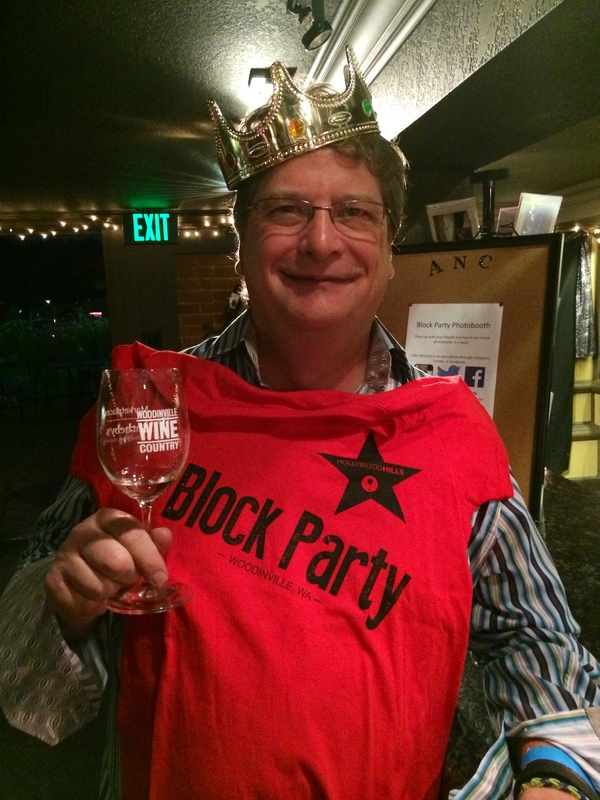 This years party was a huge turnout and Woodinville Wine Country had more people than expected! The weather was nice, the people were in a great mood, and we met some nice people. Tasting tickets and visits to multiple tasting rooms around the Hollywood Schoolhouse. 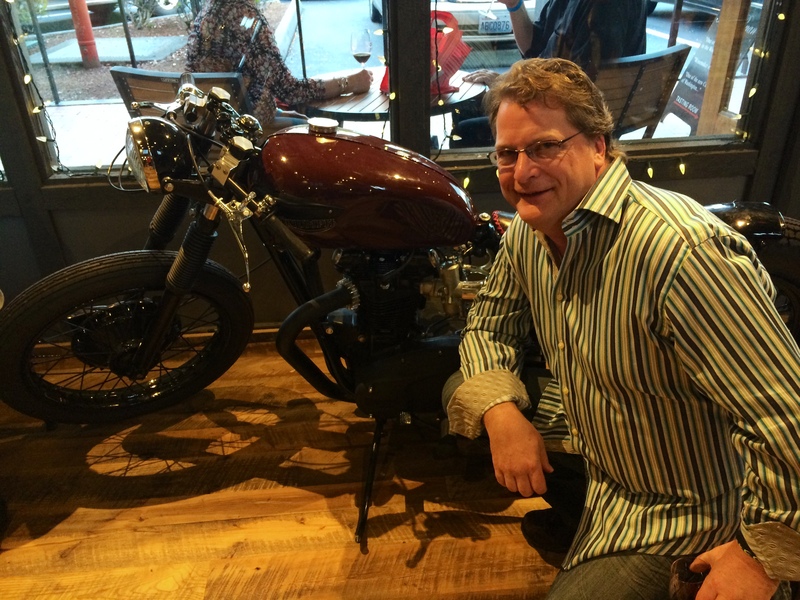 We enjoy all of the Woodinville Wine Country events! 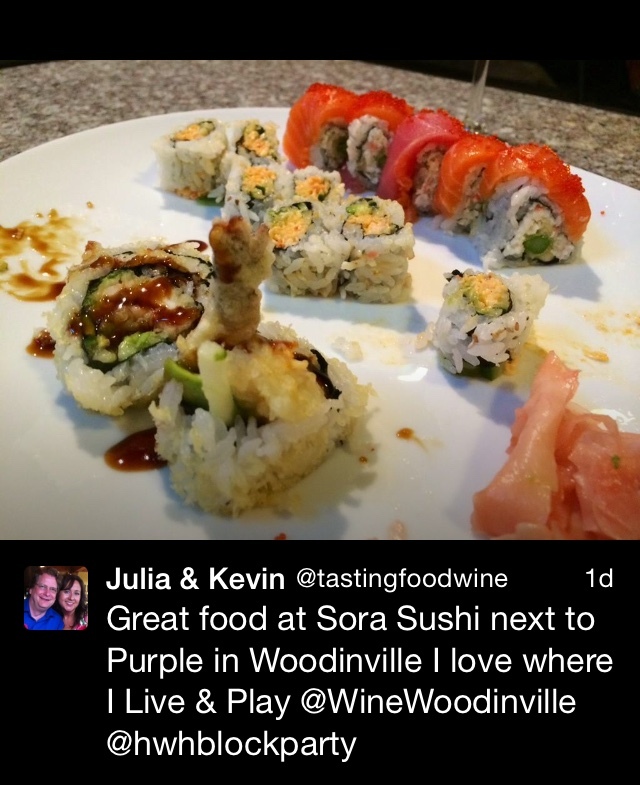 HH Block party night, we enjoyed dinner at Sora Sushi in Woodinville, it was really good! Spicy roll, tempura calamari, yum! We will definitely be back to eat here! 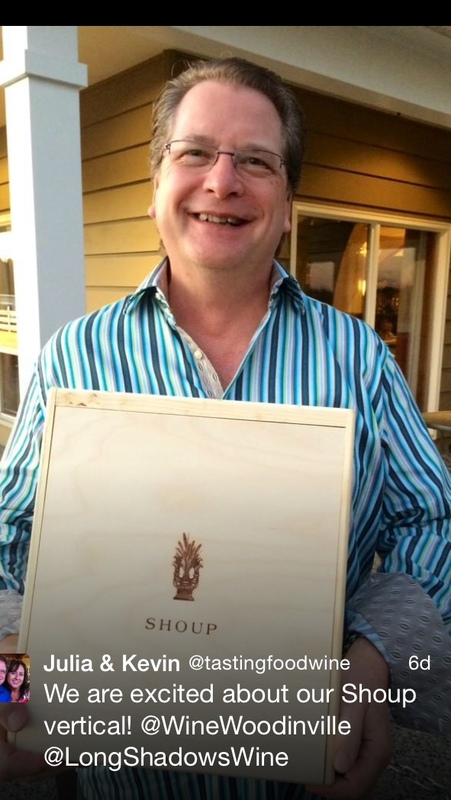 I loved surprising Kevin with a red vertical of Shoup from Longshadows, Packaged in a beautifully etched wooden box, this vertical includes one 750ml bottle of each of the 2007, 2008 and 2009 vintages. Allen Shoup is a legandary WA wine maker, recently inducted into the Legends of Washington Wine Hall of Fame. Kevin will drive himself nuts trying to find the perfect time and excuse to drink each of these over the next few years! Cheers! 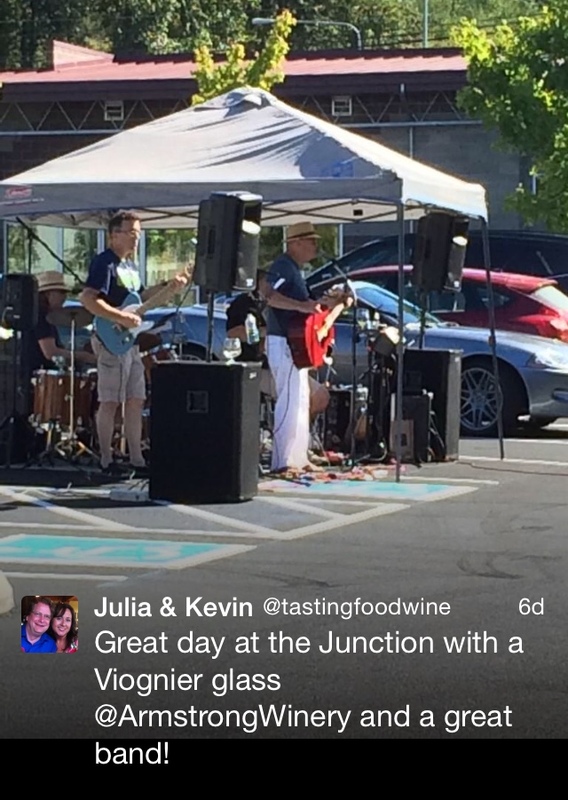 Sundays at The Junction: Food Truck Sundays at The Dirty Bucket Brewery, great food, beer and a great Viognier at The Armstrong Family Winery, The Seahawks game was on that day, so there were not too many people out, we got to enjoy a front row patio seat to listen to the band! 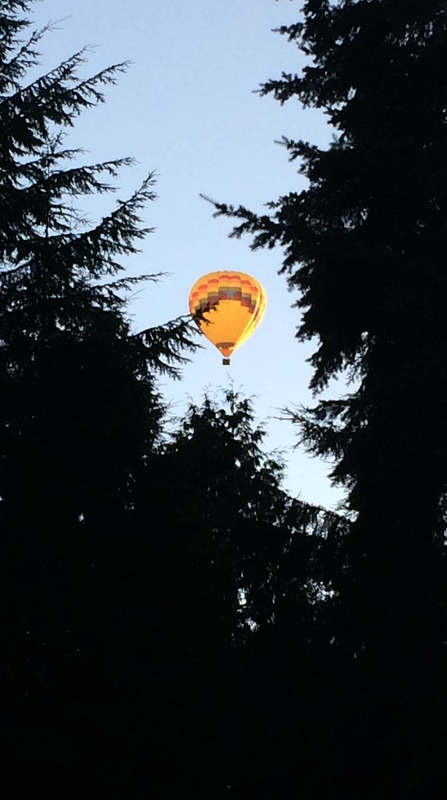 Get out there Woodinville and enjoy all that this city has to offer! 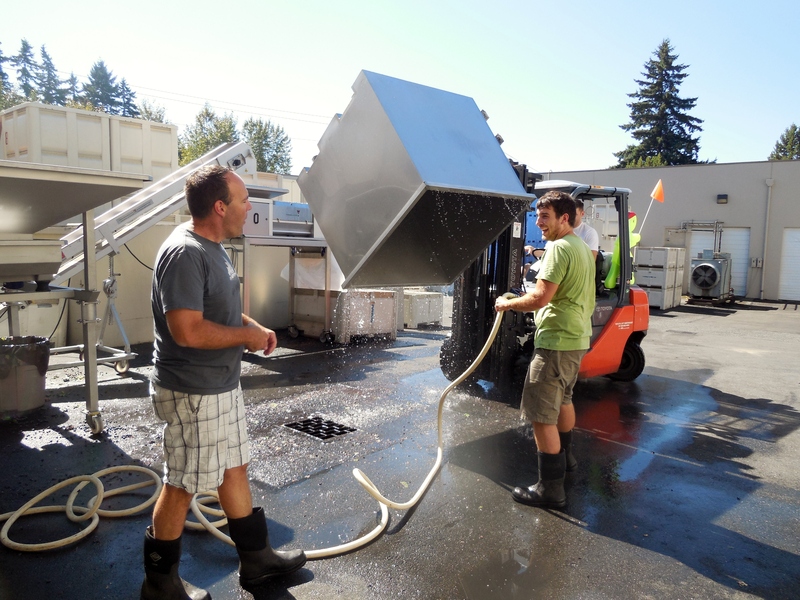 Get your crush on in Woodinville Wine Country! Now’s the time to watch or give a helping hand during one of the most exciting times in here in Woodinville, WA. 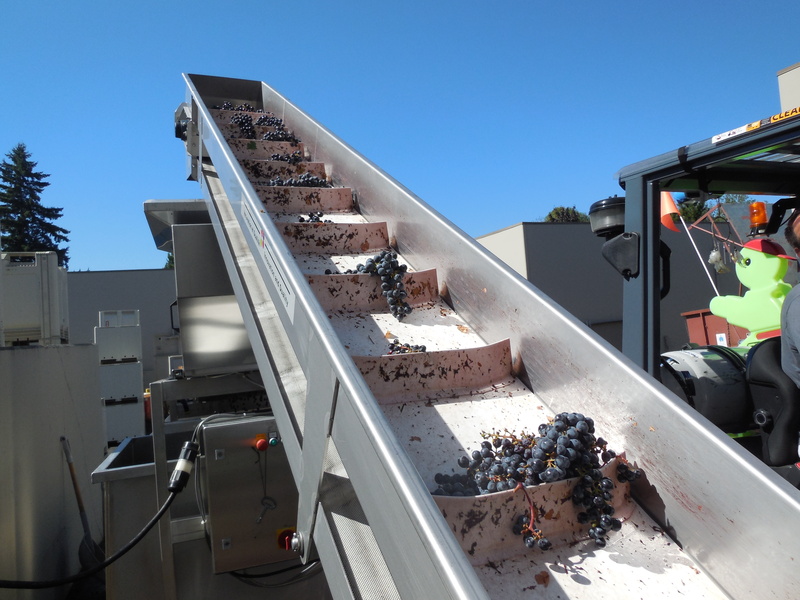 Fruit is arriving daily; I wish we could take a two month sabbatical just to volunteer at the wineries! It is so fascinating, the entire process from bud breaks to harvest. 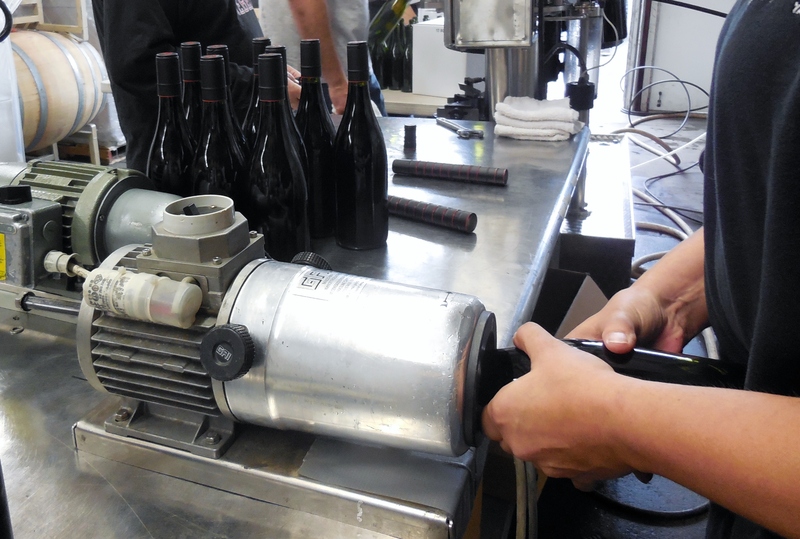 Part of crush time is bottling the wines if they are ready to make way for the fresh grapes and a new vintage. 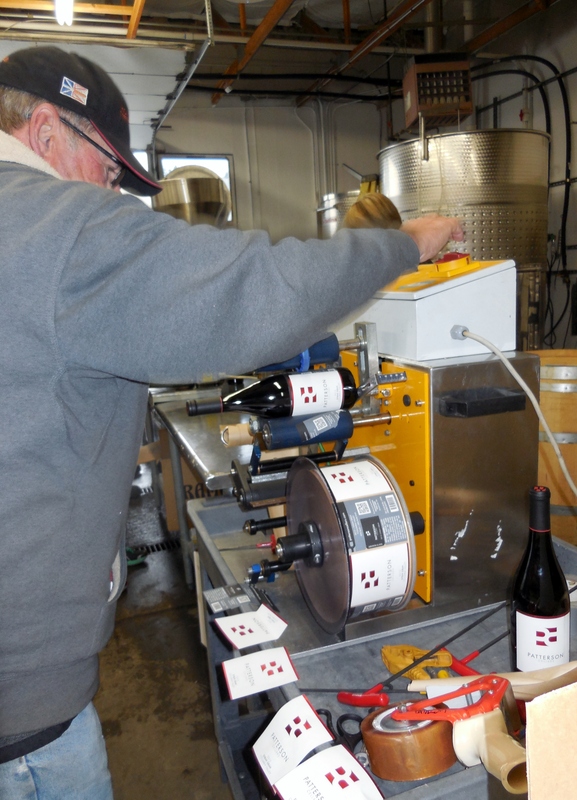 A couple of weeks ago, we helped bottle 120 cases of Syrah for Patterson Cellars. 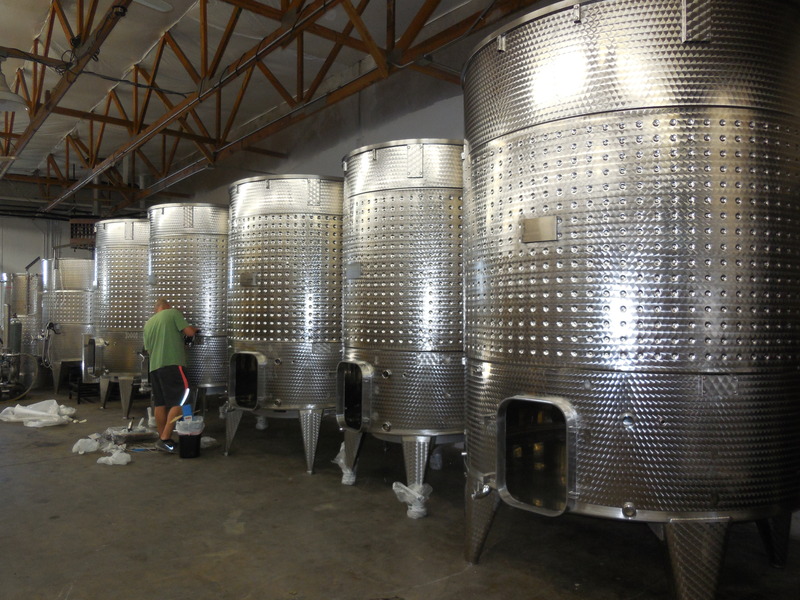 Last weekend, we wandered the warehouse district to see the crush action, Patterson just got some brand new tanks and if you are a wine geek this is super cool to watch them try to get these mammoth tanks in place. We crossed the lot to see Sparkman Cellars; I was on the lookout for Thanksgiving wines and picked up a Pinot Noir and Birdie Riesling. The Pinot Noir by Sparkman Cellars is a must this year. 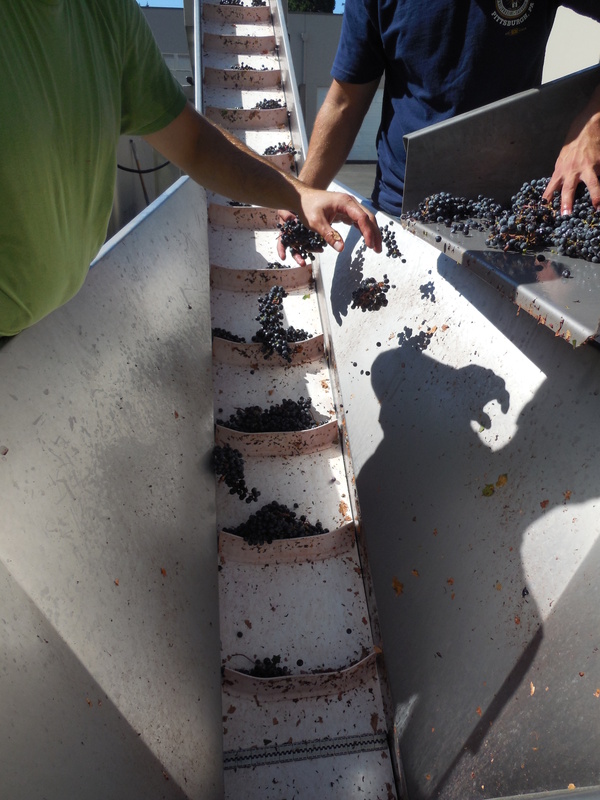 While sipping on glass of the new Sparkman Darkman Syrah, we snuck out back to see Jerry and crew from Guardian Cellars working crush out back, destemming the grapes. These three guys made it look like child’s play! After watching the crush action, a quick sneak into the tasting room at Guardian to grab a bottle of Angel to have with dinner, one of the best Sauvignon Blanc’s out there. 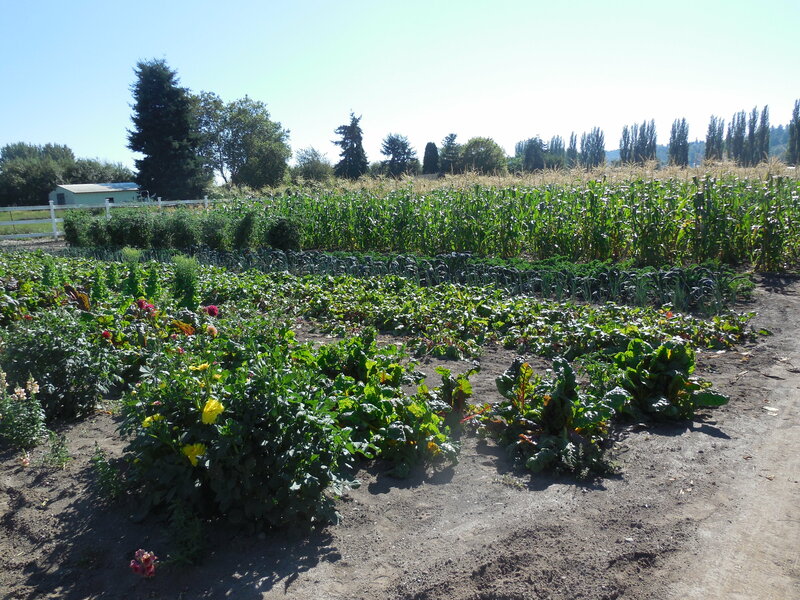 As we headed out to Redmond to pick up some fresh caught Salmon at a friend’s home, we had to land a quick stop at the Funai Farm, which has been serving the valley since the 1930’s. 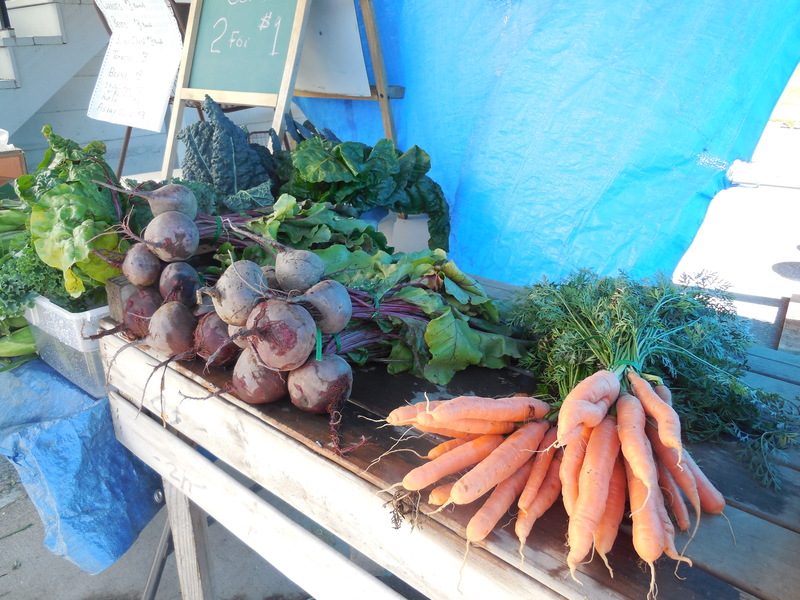 We picked up vegetables for dinner; kale, chard, carrots, beets and plums. Harvey took us down to the field and pulled a couple of ears of corn that we chomped right into, they were so sweet, like fruit. 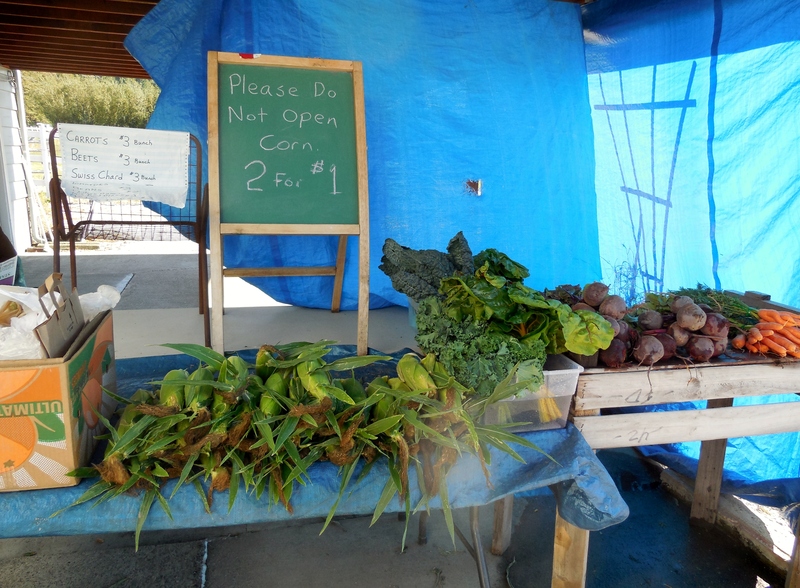 Stop by the Funai Farm when you see that ladder out with the “white corn” sign on it, they are located at 14209 Woodinville – Redmond Rd NE, right next to Woodinville Lavender. Stop in at Woodinville Lavender for their fantastic lavender products and even lavender ice cream! 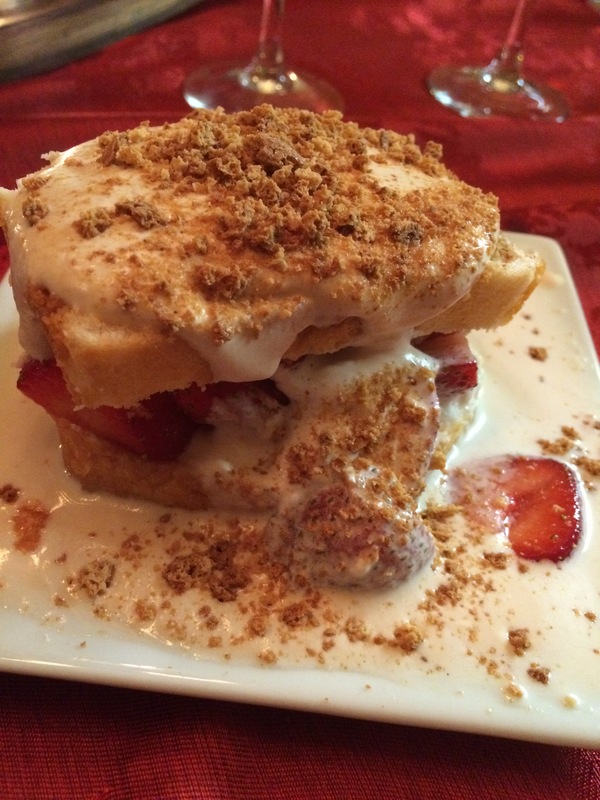 If you love wine and food, you must make a stop in Woodinville! We are so blessed to live here and make sure you sign up for volunteering at one of your favorite wineries!